I think most people have had at least one person in their life who suddenly decides to change their name as an adult. This can be a difficult adjustment, as one at first questions the motives behind the personal re-branding (Attention getting? Self-hating? Psychotic? Capricious? Sincere? ), then struggles to really internalize the switch and reprogram one's internal Rolodex so as to not spout out the wrong name in public, and ultimately accepts the switch and each person's right to control their own identity. Unless a cult or psychedelic or something is involved, in which case it's all a lot more complicated. I've had two rename-y friends in my life—a friend from high school named Jon who decided he would go by his middle name, Joel, in college, and a childhood camp friend who, upon moving to Portland, decided his last name would be Rockstar. And now, it seems, I'm going to have a third. 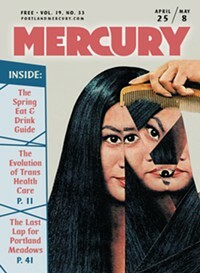 MERCURY: Why are you changing your name, and why are you doing so at this particular juncture? STARFUCKER: We're changing our name because it just doesn't make sense anymore. We never thought Starfucker would make it as far as it has, and never had any expectations of success. At this point we need to be able to either put more into music, or just stop doing it so we can get nine-to-five jobs to pay our rent. Right now we're in this Bardo where we don't quite make a living off music but we put so much energy into it that we can't put any time into a real job either. We just need to get serious about one or the other. The name has been a problem for us in a lot of ways. We've missed out on opening slots with bands we really like, and we hope to tour Europe soon where there is already a Starfucker. Someone booked us once thinking we were the European Starfucker. Is this just a name change, or is it meant to reflect some stylistic or structural change in the group or its music? It's definitely just a name change. We will still be the same band with the same philosophy. The music, of course, like anything else, will always be evolving. Why did you decide to come up with your new name via a fan submission contest? Who will be picking the new name and what will your selection criteria be? The reason we decided to have a contest is because we always want to keep a close connection with our fans—we started off playing house shows, which we love—and want to keep that level of intimacy as much as possible. So having a contest with our fans is a way that they can participate and have a say in what we should be called. We did a contest before with a T-shirt design and it went really well. It gives people an opportunity to be creative and do something they might not have a chance to do otherwise, which is rad. In the end, the four of us have to agree on the name, and we all have to like it. How many submissions have you received so far? Have you been looking at them as they come in? If so, any strong contenders at the moment? There have been hundreds of submissions so far, and we're checking them frequently. Being on the road makes it hard to get internet time in, but we've had a lot of great conversations with people at shows about it, so having it line up with our tour has been a great way to talk to people in person about the change. We're not ready to reveal any contenders at the moment, usually we let a name brew in our heads for a few days, or weeks. When do you expect to make a decision and announce the new name? Sometime in October we'll decide, but there isn't a set deadline. Are you at all concerned that you might alienate or confuse people who are already fans of your music? Of course that is an issue we're concerned with, but hopefully the music can transcend the controversy surrounding the name change. That is also why we're having the contest with our fans, so as not to alienate anyone, and let them be part of the process. We do realize we'll have to be "the band formally know as Starfucker" for a while, which is fine. Anything else about the science, art, and politics of name changing you'd like to address? Band names are usually always stupid at the beginning, but as you grow with a band and its music, the name grows with it too, so it doesn't matter how stupid it is as long as the music can carry it. In our case however, the name is holding the music back, which should never be the way it is. Having to put a name to your music or art is necessary, but shouldn't be the focal point. The music or art should speak for itself. Aside from the name game, what are your plans for the rest of the year and beyond? We're hoping to tour Europe, and spend this winter writing new material.